Federal's American Eagle line of ammunition is geared towards shooters looking for economical ammunition. The American Eagle line of ammunition has products in almost every caliber, and mostly uses full metal jacket (FMJ) bullets, which is perfect for range training on a budget. 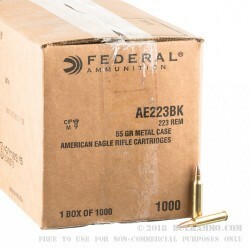 This 223 Remington ammunition, from the American Eagle line, features a 55 grain full metal jacket bullet, and uses a boxer primed reloadable brass casing. This ammo is perfect for range training with an AR-15 platform rifles, or similar 223 rem semi-auto rifles. These bullets DO NOT have a steel core, and are safe to fire at steel targets. All these attributes also make this ammo a great option for shooting competitions like 3-gun, which use pistol, semi-auto rifles, and shotguns. This ammunition is produced in Anoka, Minnesota, where Federal Premium Ammunition is headquartered. They employ about 1,400 people at that facility, which supplies quality ammunition all over the country. Fast delivery. Fast order.nice I will order again and again . Fast Delivery as with all Bulkammo. Great Ammo at great price and lightning fast delivery. I was tired of dealing with delays from another company I have dealt with for years. They'd say they had the product only to find they actually didn't... It was on back order or some guy just before you bought everything and the site would still let you put your order through. Fast shipping, I order Tuesday and got it the very next day without paying for next day. Looks great. Can't wait to burn through some . Great products & service !!! Great price, great product, great cusomer service. I have been shooing for awhile now and I just took the plunge into an AR platform. 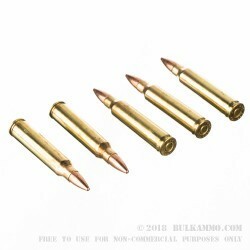 I wanted to find a bulk buy and for the price, these bullets perform very well for what I use them for (target and furbearers). They leave a nice small hole in my pelts and deliver more than enough power to take my targets down at range. On the flipside, they are a good overall bullet for a day at the range. I have been saving my brass so I can reload em and put another 1k down the barrel. Nothing made me happier when I opened the box and saw 1000 rounds of Ammo just waiting to be fired. Out of 1K rounds I had no imperfect ammunition. No fail to feed, fire or eject from a PSA 16" CHF middy barrel. YMMV depending on gun/options. I posted awhile back about having problems with misfires. My apologies to Bulk Ammo and to Federal. I recently took My Remington r-15 into a gunsmith and had my Hammer Spring replaced. Since, it fires fine and no ammo problem. I would recommend this Federal Ammo to anyone looking for value and quality. Been through almost 2000 rounds of this ammo. Have misfires about every 10 rounds. Would not recommend it to anyone else and will not be purchasing it again. My Colt HBAR II Target Competition (1:9) loves this ammo. At the 50 yd line, I was shooting a 1" group with iron sights. Half inch groups with a 2x Aimpoint. The trend says that a shooter with better eyes would do even better. To put that in perspective, I tried 62 gr Federals and shot a 4" group with the Aimpoint so I'm pretty happy with this stuff. What a great box of ammo ! Review by N.C. Gun people. 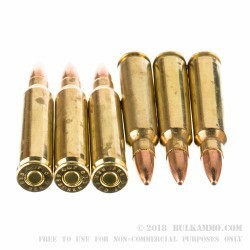 I have ordered several lots of ammo including these, shot well in bout my Mini 14's and my AR. Every box of ammo I have ordered was shipped quickly, fairly priced (In todays market) and shot well. What else could you possible ask for. Great Job Guys, you're doing great. 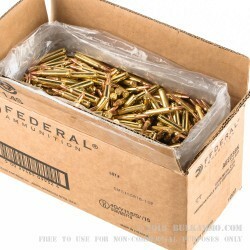 Gotta Get You Some Of These Federal 55 Grain FMJ , Great Ammo ! Lucky to get this ammo!!! Ordered on a Friday received on the following Tuesday. good ammo. Price was better when I purchased my last order. Very happy, cheap and fast shipping. GREAT PRODUCT! , FAST SHIPPING! , WILL BUY HERE AGAIN SOON! Havent fired alot of it yet, but so far so good, and for the price, you cant beat it. Q: Where is this ammo manufactured? A: Good Morning, Federal ammunition is all made in their US based manufacturing plants. Q: Mail-in rebate or online ? A: Federal offers both a mail-in printable form, as well as a digital form that you can fill out. You can find these forms on Federal's website. Q: Is the SKY# AE223BK for this case? Does it qualify for the current Federal rebate program? A: The barcode for the rebate is located on the bottom of the box. Yes, Federal has extended the deadlines and many of their rebate programs. Please be sure to visit Federal's promotions page for all the details on which rounds qualify for these rebates. A: Hello Stephen, This ammunition is loaded in brass casings with a standard 55 grain FMJ projectile. A: Hello Woody, This ammunition is all new manufactured. Q: What is the velocity (fps) of this round? A: Hello Jay, Federal lists the velocity of their 55 grain .223 ammunition at 3240 fps from the muzzle. A: Hello Joe, These 55gr. FMJ rounds by Federal in .223 have a lead core, copper jacket, and a brass case. They are safe to shoot on ranges that do not allow magnetic rounds. Q: is this ammo re-loadable? A: Hello Steve, Yes, these 55gr. FMJ rounds by Federal in .223 are reloadable. They have brass cases which work great for reloading. Q: Are theses just the caseings? A: This American Eagle .223 Remington product is loaded ammunition. No "handloading" or "reloading" procedures are required. This .223 ammunition will fire in both .223 and 5.56 NATO rifles. All components from American Eagle ammunition are non corrosive. The spent casings may be saved for the reloading process if desired. Q: Does this ammo use corrosive powder? A: American Eagle loads this, and their other products with non corrosive powder and primers. Their brass is boxer primed and great for reloading. The bullets used for this .223 Rem ammo feature a boat tail design for improved accuracy. Q: What does boat tail mean ? How does it differ from FMJ ? A: The "boat tail" is the design at the base of the bullet; this is the portion of the bullet we do not see when it is seated into the brass. The boat tail feature is a property of a full metal jacket bullet. The purpose behind this design is used to improve bullet flight and keep it on track to its intended target. This American Eagle ammo from Federal is considered to be full metal jacket. Q: Is this ammo made in the USA? A: Yes, it is. This product (as well as the rest of the American Eagle line of product) is made in Anoka, Minnesota. Our team has visited this plant on a few occasions and can attest to the quality of the process and the results (we've also shot a lot of it).